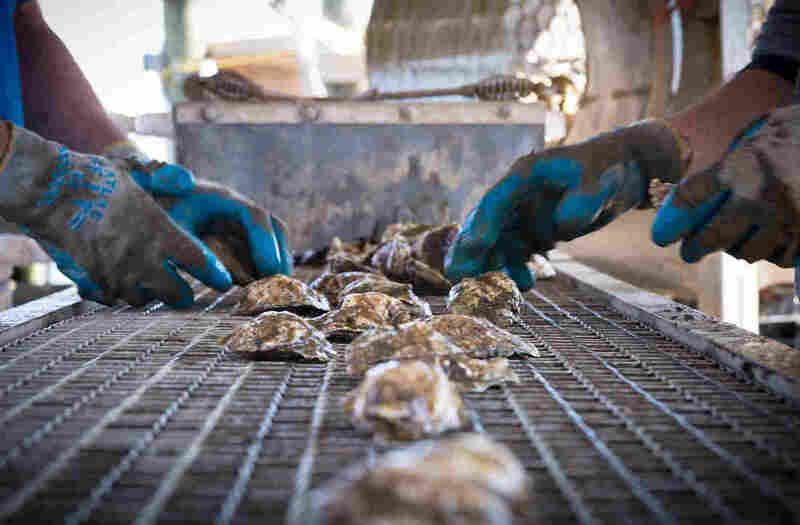 The Oyster's Mighty Comeback Is Creating Cleaner U.S. Waterways : The Salt The farm-to-table movement has caused the farming of oysters — nature's hardworking little water filters — on the East Coast to double in the past six years. As the wild oyster population resurges, there is an added bonus — our waterways are getting cleaner. The farm-to-table movement has caused oyster farming on the East Coast to double in the past six years, and the industry has shown no signs of slowing. But not only is the mollusk's mighty comeback good for consumers and fishermen — it's also good for waterways. Jimmy Parks, longtime chef and owner of the Butcher Station in Winchester, Va., says the way we eat oysters has changed in the past decade. "As much food as possibly can go on my plate at the least amount of money I can spend used to be the way things were," says Parks. "Now people are getting away from that, and they're gravitating toward ... cleaner sources." People are also paying attention to an oyster's taste profile — sometimes called a "merroir" — of where they come from. For instance, oysters from New England are usually saltier than Chesapeake Bay oysters, which are milder with a buttery finish. There are more than 150 varieties of oysters harvested and sold in North America, but only 5 species. Each area has oysters unique to its waters. Tim Devine, who owns Barren Island Oysters farm in Hoopers Island, Md., grows oysters that are immune to the diseases that have devastated wild oyster populations. His operation is sustainable: He's taking nothing out of the water except the nutrients his oysters have eaten, and he's putting nothing in but the cages that hold his oysters. "The coolest thing is within our cages we see these little shrimp-like creatures that actually eat the pseudofeces of the oysters. And then things like seahorses and crabs and other things eat those little guys, and then the food chain has begun," says Devine. The cages are creating reef-like habitats that help small sea creatures survive. But the biggest benefit of these farms could be their ability to filter water. Gulnihal Ozbay, an oyster researcher at the University of Delaware, says oysters are filtering phytoplankton and excessive nutrients out of our waterways. "It's like almost like in the aquarium we have filters, same thing with oysters," says Ozbay. Farmed oysters are raised in clean, monitored waters, so they're basically making clean water cleaner. Ozbay says what we really need are sacrificial oysters in our most polluted waterways: "These are filter feeders. As they filter, they will accumulate some of the contaminants." States like Virginia have already initiated programs to increase sustainable wild oyster populations by restoring reef habitats and rotating harvests. And other East Coast states are processing a backlog of applications to lease thousands of acres of sea floor for new oyster farms.